Founder and head prophet of Christ Mercyland Deliverance Ministry, Warri, Prophet Jeremiah Fufeyin surprises Stephanie Idolor, the corper who recorded the video about the little girl Success and shared it online, with a brand new car just weeks after giving her N2M. The man of God got to know the lady after the viral video of a 7-year-old primary school student some weeks back who Stephanie recorded. Success was complaining about her being sent home from school because she didn’t pay her tuition fee. After the video went viral, the little girl and her family received financial help from Nigerians who were moved by her story and her determination to learn. The corper, Stephanie Idolor, who recorded the video and shared it online, was not left out of the blessing as many Nigerians have reached out to her including Prophet Jeremiah Fufeyin who gave her N2m for her effort. 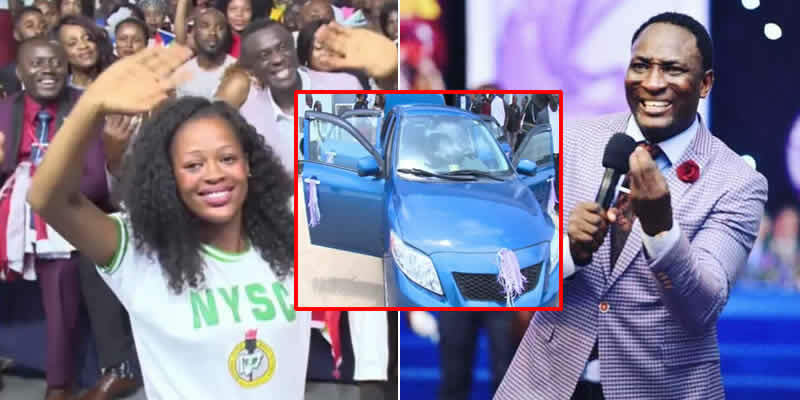 On Sunday, during the church’s thanksgiving service, the man of God called Stephanie out and surprised her with a brand new Toyota Corolla car while also gifting her parent with N500,000. The prophet recalled how he received unexpected blessings just few days after giving Stephanie the money and that convinced him to do even more for her.